Zheng Chongbin (b. Shanghai, 1961) is one of the most notable artists in the emerging field of contemporary Chinese ink art. Throughout his career, Zheng has systematically deconstructed and interrogated the origins of abstraction in both traditional Chinese and contemporary Euro-American artistic practices. Without abandoning his rigorous early 1980s training as an ink painter in China, Zheng has embraced precepts of American Abstract Expressionism, field painting and Minimalism. A fresh and dynamic synthesis of approaches from both traditions, Zheng's paintings resonate with both Eastern and Western art history, playing one against the other to break free of both. On the surface the two traditions would seem to be at odds, but there are deep affinities that make the synthesis work. For example both Zheng and the Abstract Expressionist Jackson Pollock rely on controlled chance; however, unlike Pollock, Zheng is able to anticipate the final outcome of his process with great accuracy because of his decades of immersion in the classical ink medium. His work proves the 21st century's powerful potential as a temporal site of transnationalism in the arts. In 1984, Zheng Chongbin graduated from the Department of Chinese Painting at the Zhejiang Academy of Fine Arts in the lake city of Hangzhou (now the China Academy of Fine Arts). On graduation Zheng was invited to join the Academy faculty staff and he went on to teach there for a further four years. A decisive shift came for the artist in 1989 when he was awarded an international fellowship at the San Francisco Art Institute where he was to study for the next two years, acquiring his Masters of Fine Art in 1991. Over this period he engaged closely with the radical transforming practices of conceptual art, installation, deconstruction, and performance to uncover ways in which this innovating Western intellectual tradition could be used to transform the philosophical and aesthetic underpinnings of his own painterly practice. 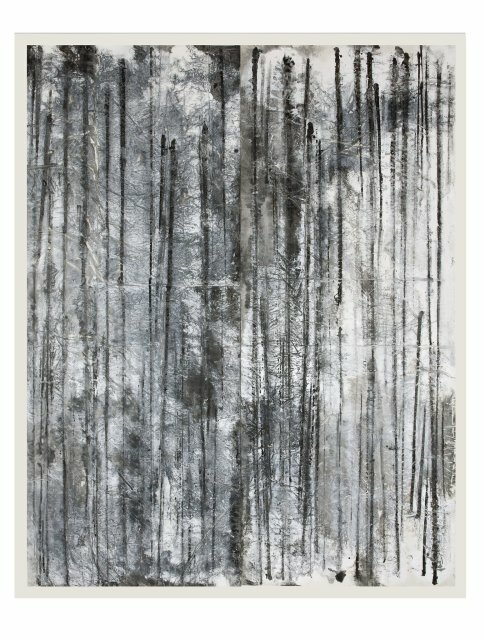 Zheng Chongbin's current artistic production focuses on expressing contemporaneity using materials and techniques, some of which, were formulated over a millennia ago. His innovative employment of white acrylic along with ink affords white portions of his composition not just a positive value, but also a solid material presence. In juxtaposition with the substantial acrylic, ink also comes to have an existence as a material rather than simply as a carrier of gesture or form. As a result, Zheng's paintings can be read not only as images residing in two-dimensional illusory space but experienced as material objects with real, physical presence. Although his paintings are decidedly universal in their aesthetic language, Zheng never departs from one very profound principal of traditional Chinese painting; a principal which interestingly resonates with practices of radical contemporary performance. Qiyun 气韵 or "vital resonance" describes the way in which the artist may imbue the work he creates with the resonant energy of the subject itself. In turn, this energetic impulse is imparted directly to the audience through their sense experience of his creation. In this way the viewer becomes not only a passive receiver but also an active participant in the creative manifestation of each of Zheng Chongbin's works.